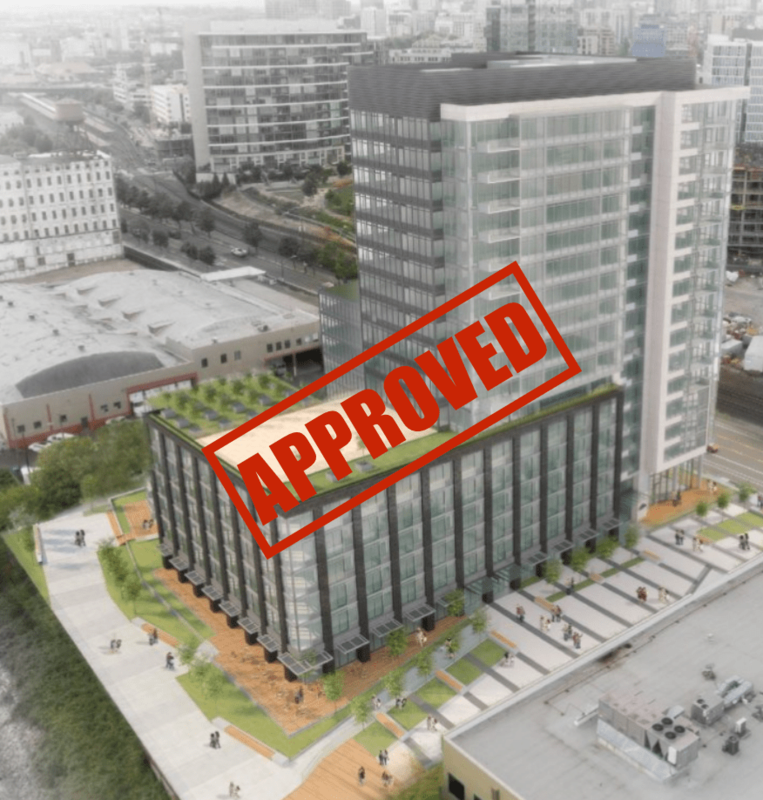 Back in March, we were critical of a decision by the Portland City Council to deny approval of a 17-story apartment building in the city’s growing Pearl District. The building was opposed by neighbors (who lived in other, recently build residential towers), who complained the new building, called Fremont Place, would block their views. The Council decided, ostensibly because the building didn’t fully comply with the cities riverside greenway setback requirements, to deny the approval. We argued that this use of the city’s discretionary approval power ran counter to the City Council’s stated concern about city housing supply, and that it would send a chilling signal to other developers. The Fremont Place project generated considerable discussion in the media. Council members, to their credit, re-thought their initial decision. The developers agreed to make some very modest changes to the building’s ground level plan to accomodate a wider walkway along the river, but kept the height and bulk of the proposed building the same. They also reached an agreement to get the local neighborhood association, which had fought the project, to endorse it with changes (and also with the promise of a $35,000 payment to the neighborhood association to cover its legal costs in the matter. On May 31, the Council voted unanimously to reject the appeal, approving the project moving forward. Portlander’s should be grateful to the City Council for drawing a deep breath, giving some time for the parties to make some adjustments, and then approving this needed housing. While this is good news, another land use matter showed that this issue is hardly settled. Across the river from the Pearl District, in Portland’s Walnut Park neighborhood, a different developer sought a zone change to allow the conversion of a church parking lot into an apartment building. The developer was offering to 50 below-market, affordable apartments adjacent to the Alberta Abbey. As in the case of the Fremont Place matter, this decision was one in which the City Council had broad discretion to approve or not approve the project. (This is seldom the case in Portland, where state land use law provides that once an area is designated for a particular land use, such as apartments, the city must approve or deny the proposed development based on a limited set of clear and objective standards). Because this case involved a plan change–redesignating a parking lot designated for lower density use to a higher density, commercial category, it was subject to council discretion. After a public hearing, the Council declined to move ahead with the needed zone change proposal. According to Portland for Everyone’s Michael Anderson, that means the property’s developer is likely restricted to building a much smaller building with no more than about 28 units. It’s a far smaller battle than the Fremont Place project, but it’s a reminder that Portland’s City Council–like municipal government’s everywhere–is always facing a steady stream of decisions about whether to allow more housing. The fact that rents and home prices are rising, especially in close-in urban neighborhoods, is a good indication that demand is still outpacing supply, and that the city needs to lean more heavily in favor of making it possible to build more housing. The change of heart on the Fremont Place project is a big step in the right direction, but the council will have to take many more similar steps in the months and years ahead, if it hopes to seriously address the city’s affordability challenges.